Widespread in woodlands and forests on swampy ground. 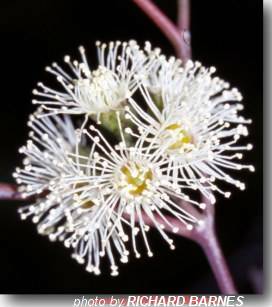 Frequent on coastal sandy heaths and sometimes forms pure stands on badly drained soils; occasional on well drained soils in mixed eucalypt forest. Useful for planting in wet areas and to provide dense shade. A lso as a second line planting for coastal conditions. IProduces valuable hardwood timber, which is also good for firewood. Not suitable below powerlines. 6-8 weeks to pricking out.